A Reiki attunement can be a powerful sacred time for those who receive it. When a Reiki Master initiates a student, they are gifted with the ability to then channel Reiki energy through their own hands - to heal oneself & others. Following an initiation the student becomes a Reiki Practitioner Certificate & Reiki manual provided. A Reiki initiation (attunement) is passed down by a Reiki Master through a series of sacred rituals. A Reiki attunement is an initiation to open up crown, heart, and palm chakras to allow Reiki energies to flow through. Reiki attunements open a channel for the Reiki energy to flow from practitioner's hands to the client. There are 4 attunements in total. The actual attunement process for all four initiations are secret and kept so for sacred reasons. The initiation involves the student sitting on a chair with their eyes closed and hands together in a prayer position. The Reiki Master then moves around the student operating various sacred rituals, which eventually after the second day of initiation will result in a Reiki practitioner. Throughout the whole initiation process, the Reiki Master and the newly initiated practitioner are constantly giving Reiki treatments to each other. Here, the new Reiki practitioner is taught the various body positions that are more conducive to Reiki energy as well as all the necessary information required by Reiki I. The practitioner is taught how to give hands-on as well as hands-off techniques, something that has been rediscovered in the West quite recently. This diversity of healing allows the Reiki practitioner to then improvise and innovate with their healing when they leave. Firstly it paves the way for the student being attuned to undergo a powerful spiritual transformation that lasts for the rest of their lives. Being attuned means that one is baptised with cosmic Divine energy that can literally change lives for the better. The Reiki initiation opens a practitioner to receive and channel more universal energy, which allows them greater connection to Source as well as their Higher Selves (Inner Spirit). As we connect with Spirit more and more, we remember the reality of who we are – Spiritual beings having a human experience – it is here where we begin to experience true miracles in our lives. Secondly is that once attuned, an individual immediately becomes a Reiki practitioner. 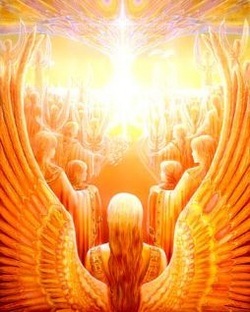 This means that they now have the ability to heal themselves using Reiki. Self-healing can be practised daily to allow Universal energy to permeate all levels of being – leading to a calmer, vibrant and more fulfilling life. Physical pains can be self-healed as well as emotional and mental turbulence that we often feel in our lives. Thirdly of course, is the ability to offer others the wonderful gift of a Reiki treatment session. Giving Reiki sessions not only help to heal and balance a recipient but also wonderfully healing the practitioner whilst he/she gives the healing. Many Reiki practitioners choose not to pursue professional engagement and enjoy wonderful lives with the ability to self-heal and to heal others if they choose. And of course, many choose to professional engage in Reiki treatment to learn deeper healing techniques (as with Reiki II and Reiki III: Master Teacher Training). Anyone can receive a Reiki attunement, and as soon as one does they are open to channel Universal energy for the rest of their lives. There is no way that someone “cannot be good" at Reiki. Once initiated through the attunement process, an individual becomes a Reiki practitioner for life. Also remember that there is no wrong way to give Reiki since the energy that is channelled is intelligent in itself. Therefore Reiki energy will always work for the highest good of the recipient and the practitioner. Hearing about the history of Reiki, where it originated. Who is Usui? * Eliminate or reduce intake of meat, fowl, or fish from your diet 3 days prior to your class date. Not necessary but beneficial. * Lower your intake of alcohol for at least 3 days prior to the attunement. Preferably none, to clear your energetic field. * If you are on any type of medication, continue to take it as prescribed prior to and on the day of attunement. * Smokers should take care to smoke as little as possible for the day prior to the class date and on the day of the attunement. * Become conscious of outside stimulation (television, radio, computers, newspapers). Observe with detachment. * If possible, find moments of solitude. Meditation and spending time with nature (walks, sitting beside streams, etc.). * Be gentle with yourself. Try not to tackle any tasks, physically or emotionally that will deplete your energies. * You may choose a water or juice fast for 1 to 3 days prior to the attunement. (This is optional and a rare luxury). Try to drink plenty of water. PLEASE ARRIVE BY 9.45am. The format of the day will be explained and there will be plenty of opportunity to share your healing with others from the moment you are attuned. "A lovely, full-on day. Grateful for how the day was organized: felt very well 'looked-after' and enjoyed the order of the day. Am enjoying the first days of exploring this new 'thing' : -) Really appreciated Savitri's approach: very clear. Many thanks to everyone <3"
"It was a fantastic experience. And the energy during the event was out of this world. Really and truly worth it. Many thanks to my Reiki Master Savitri Sriharan." "This was a beautifully run course Savitri teaches from the heart"